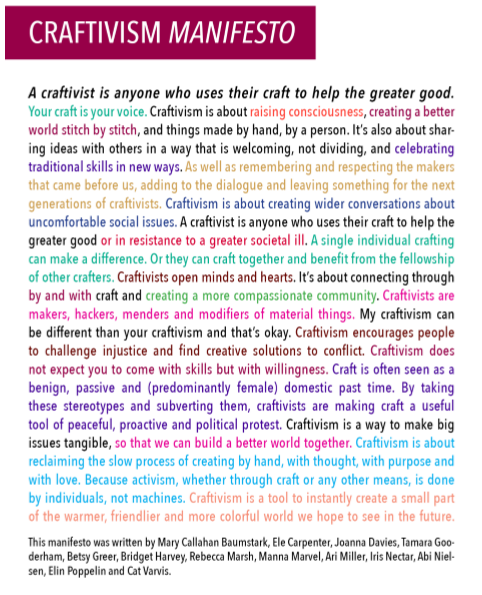 My name appears at the bottom of the Craftivism Manifesto as a contributor. Yay! I discovered the Craftivism movement around two years ago finding Craftivism: The Art of Craft and Activism by Betsy Greer on the "new and notable in 700s" display stand in the downtown Houston Library. Sometimes you read a book and it subtly changes the way you think. And then things are never the same again. Reading that book changed the way I thought about my craft. I am maybe getting a little ahead of myself. I know my mum is going to ask me what this is, just as I had to explain to her what a podcast was. 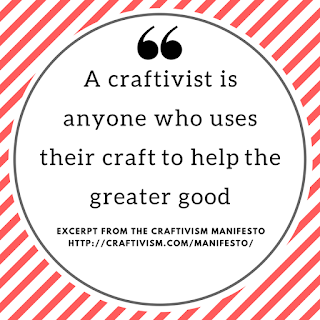 The word craftivism derives from the combination of the words: craft + activism = craftivism A craftivist is anyone who uses their craft to help the greater good. I teach people and see their joy in mastering a skill, I run a craft group and we make things collaboratively for local charities. I make gifts for people that I care about - sometimes they even like what I make for them! Back to the manifesto. You can find this on Betsy Greer's website (btw Betsy is godmother of Craftivism). I am not going to read the Spanish version. I am learning Spanish but I'm just not that brave yet. Betsy was interviewed by the marvelous Vicky Howell super famous crafter and broadcast personality, who lives in nearby Austin, Texas on her Craftish podcast series so check that out here. And I spotted a recent article in Molly Makes (wonderful British craft magazine) Making Good: Five Ways to be a Craftivist - an interview with Sarah Corbett the founder of the Crafivist Collective in the UK. Whow I wonder if I am a CRAFTIVIST now that you have explained it so well darling daughter! 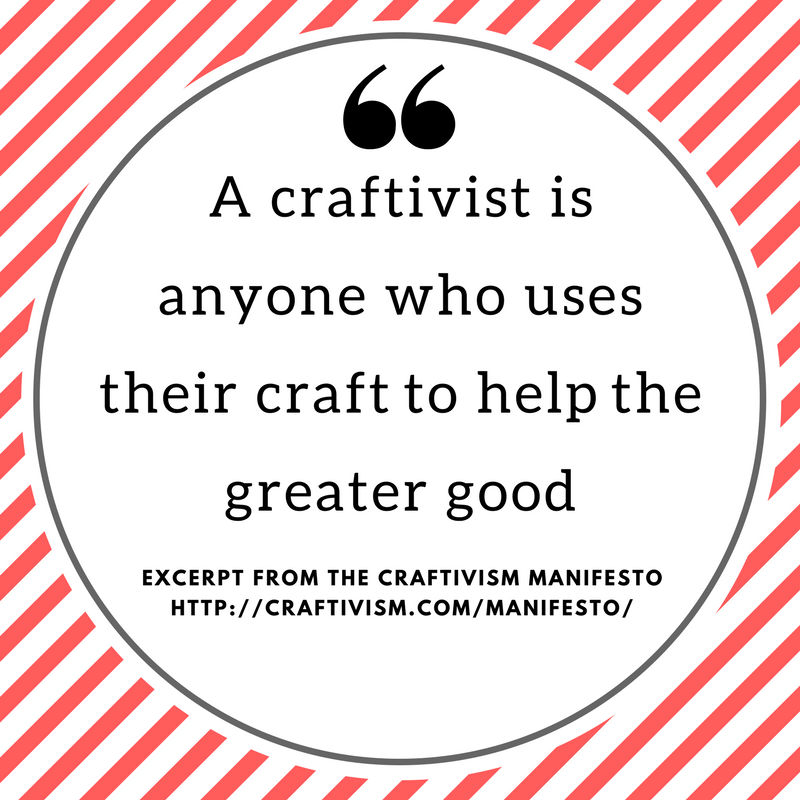 Think I want to be as Craftivism manifesto sounds so right and worthwhile. Of course you're a craftivist mum!!! Where did I learn it all from if not from you? I'm impressed to see your name on the manifesto. You are fortunate to have so many influential crocheters and crafters in your region. My favourite craftivism project is the crocheted coral reef. I love it on all sorts of levels. These days, on a personal level, I am more environmentally aware and try to only buy natural fibres to reduce the demand for, and impact of, micro plastics in the environment. Synthetic textiles are a major source of this pollution. Consequently, I'm trying to use up the stash that has been gathering for many years so I can put the old yarns to good use and start again with more careful choices. I absolutely love the crocheted coral reef project too Jodie! One of my first mentors in the fiber world was Barbara Van Elsen who was involved in this project. It's so inspiring. Every time I refuse a plastic bag in the grocery store I say "I'm trying to save the oceans". I am really passionate about sustainability too! I have been planning to blog about this topic but I keep getting sidetracked by socks and other projects with deadlines! It's on my list! I'd love to know about your top stash-busting tips when you can fit it in! Ugh I can't believe I'm only just now seeing this! For starters, congratulations on being a contributor, that's fabulous & very well deserved! :) Second, oh heck yes I'm a craftivist! Since the moment I first realized one could knit (and of course crochet) for charity, I've been a little obsessed with making a difference through yarn. Haha. :) Thanks for the links too, I'll definitely check those out! Thank you Nicole! You are so kind. Of course you are a craftivist!! Yes it is a little bit of an obsession isn't it!? Hope you enjoy the links.